Patterned after a workbench found in wood shops at the turn of the 20th century, this traditional-style bench has it all. And it starts with the worksurface. The large top provides plenty of room to work on any project. 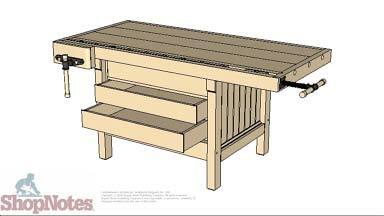 The solid-wood top also features a large face vise and shop-built tail vise. And there's plenty of storage underneath — with or without the optional drawers. Classic details, like the shop-made car siding and trim molding, add to the appeal. This video highlights the construction and features of the project.